From it’s beginnings over at Blogger, The Garage sure has changed over the past year. Version 2.0 was super cool, but with all the cool visual features it was next to impossible to add in more funtional features and some folks had a tough time reading the grey on black fonts. Enter The Garage v3.0 where we can keep the look, but offer an easy to read and navigate format that reflects the look over at Blair Valley Media. In the near future, we should be able to show videos and hopefully even a podcast or two. So keep watching for more new and exciting stuff here in The Garage. After all these years driving demos, I finally need to buy my own car again. The timing couldn’t be worse, as we also need to reshingle the roof on The Garage at some point in the next couple of months. As a result, we are on a tighter budget than would have been the case normally so the used car shopping has begun. I think I’ll take this opportunity to bring our readers along for the ride. Fortunately todays’ shopping trip provided some incredible examples of what to look out for when you are buying a used car. 1972 was the year Alice Cooper released School’s Out and I’m sure it could be heard in The Pit at Mosport during the Grand Prix weekend, even though school had just started for the fall. I’m sure all those Mutton Chop wearing Grand Prix types in the paddock were more into the Euro bands like ABBA. Sitting on the pole was Peter Revson, with a time of 1:13.6 which is still a smokin’ fast time today. The man with the turtleneck, Jackie Stewart won the race in his Ford powered Tyrrell, beating Revson by less than 1 second. I’m on a road test today in a mildly modified 350Z, with the customer in the passenger seat when he says “so….what kind of racing do you do?” I was a bit taken aback and said I hadn’t raced in years, but had driven a performance rally car and solo 1. Why do you ask? How do you know I raced? His reply: “because I’ve never driven with anyone who shifts so smoothly when driving fast”. I want to go racing, how do i get involved? Depending on where you live, finding an event may be a little tough, as many regular media outlets don’t run listings for racing. Here, the internet is your friend. Check out the SCCA site for your local chapter in the United States and up here in Canada you can check out the CASC site for club & event listings. For rally in Canada check out Cars. There are so many different styles of racing that it can be tough to choose. From oval racing to road course, from open road to performance rally, from autocross to navigational rallies, there really is something for everyone. Over the coming weeks, I’ll tell you about some of the ways you can get involved to see if racing really is for you before you start spending money. 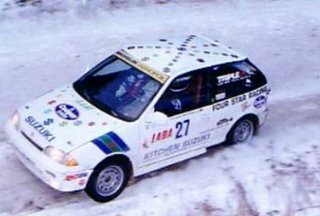 The picture above is Sandy & I in the Tall Pines Rally back in 1995. The Toronto Star has reported that the Honda Michelin Series has been cancelled for 2006. Citing poor field sizes and poor economics. It seems they had expected fields of 30 plus cars and were disappointed when this did not happen. Now normally, I’m a pretty positive person, especially when it comes to an exciting new racing series. In this case though, I’ve gotta say…give your head a shake! The racing community in Ontario had just come off a failed single marque series, with a large number of great little Nissan Sentras for sale. All these folks had just dropped a bunch of money to build & run these cars. Who exactly did they think was going to line up to buy another production race car and sit back & wait for the series to go away again? Also, having watched a couple of track sessions, I came away feeling bored! Whatever happened to the field of screaming bees that made up the legendary Honda Michelin of the 80’s & 90’s? I know that Honda was afraid of feeding the street racer image, but let’s face it. Race cars need to be heard to be cool! 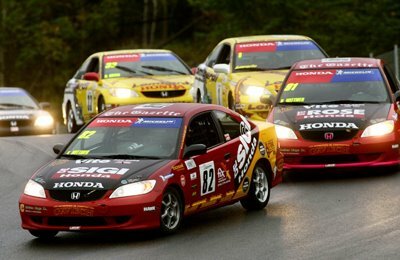 It’s a shame that the series wasn’t put together at a better time, with a stronger commitment from Honda!